Some old favorites are restocked in the store this week, with help from my special apprentice helper Gina in the apothecary. We always have such a good time crafting and creating herbal treats and magic medicines for you together. 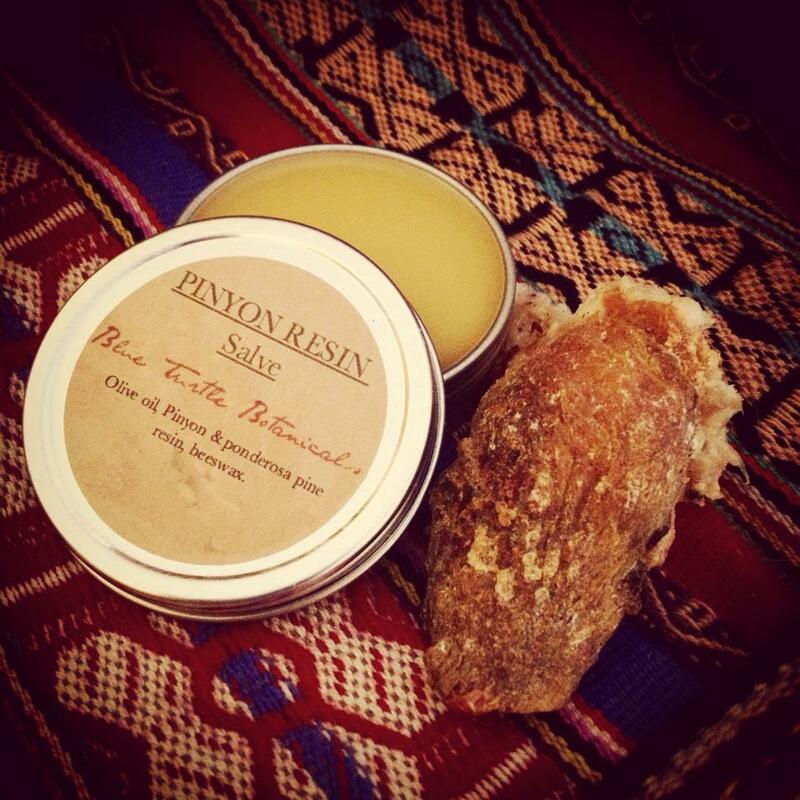 This super salve for aches and pains, sprains and strains , bruises and bumps. It contains a local herb, Yerba del Lobo, which is used much like arnica is for injuries and trauma, plus wildcrafted pain allies like elder leaf, goldenrod, telegraph weed and precious Solomon’s Seal for tendons and connective tissue healing. 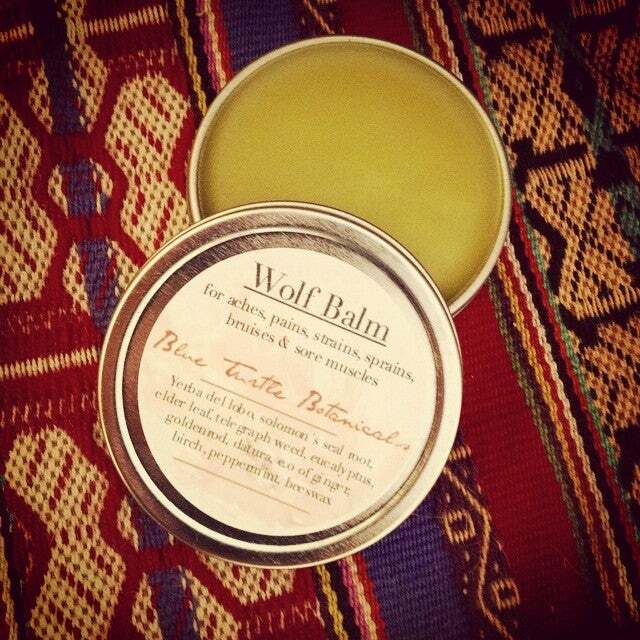 So next time you bonk yourself on the trail, trip over a rock or a root and twist an ankle, or work your muscles a little too vigorously try some Wolf Balm for relief. Local medicine from the Sky Islands and Sonoran lands of Arizona. Plus a lot of flower magic. Fragrant blossoms of Yerba del Lobo had lots to say to me last month in the mountains after a weekend of teaching, and especially wanted me to make myself a queen with a golden flower crown. A plant for your alpha within. Medicine for the Sleeping Dragon: Herpes virus is one of the most common chronic infections in humans – manifesting as cold sores, genital and oral (HSV-1) herpes symptoms and even shingles – (chicken pox is related as well). Regardless of the strain or location, the outbreaks on the skin/tender tissues it causes a lot of pain. Sleeping Dragon Salve is a proven remedy with clients and friends stamp of approval for relieving the itch, sting, pain and duration of the outbreak when applied frequently throughout the day. This remedy will offer relief for acute outbreaks. If recurring outbreaks are a problem for you, you may need to work on your stress levels, diet, and an herbal formula for long term support. I can work with you to manage and control outbreaks through natural methods so they are far less frequent and troublesome. Contact me to set up a phone or in person appointment! This beautiful smelling balsam of the forest is my go to for drawing out splinters, thorns, cactus spines and other small bits embedded in the skin, and protect the skin from chapping, windburn and other infections. Its antiseptic, pain relieving, and stimulating. It also doubles as a wonderful congestion and chest balm when dealing with winter illness and damp mucousy cough. This salve is a pure natural product, only three ingredients pine resin wildcrafted ethically from the pinyon and ponderosa pines in the mountains of the southwest, olive oil and beeswax. I only take resin from trees when it comes off freely, and never take a metal tool to the tree to pry it off. The tree offers its resin as a gift to us, once it has done its job for the tree. Its like tapping into the tree immune system. And it makes a good perfume for forest nymphs and green men. Apply freely. Study Sacred Plant Medicine with me in October! Winners of the Chakra Plant Medicine Course Giveaway! I stopped at a Utah gas station about an hour or 2 from Salt Lake City for the purpose of getting baby tylenol for my 4 yr old who had an earache..i usually use similian earache formula witch u can get at walgreens thats quite effective but we were in the middle of nowhere…anywho in the gas station i silently cused that i had to bite the bullet and buy drugs..it is against my nature but lo and behold on the counter at checkout was the pine resin gum witch i wasnt familiar with..i bought it too then looked up the uses..and one of them was earaches!! I also had broken out on my lips so i used it there then my husbands cracked finger..it might have a sting to it on open skin..so u might want to dilute on kids. The lip breakout there was a significant difference the next day and my daughters ear was relieved..i still got the similian earache formula and used it twice on my daughter but the combo of the physical application of the gum putting it on the back of the ear down the neck and the front of the ear and with a qtip put it around the inner ear..not in the ear but in the entrance ..ideally every hour..bottom line im so thankful that mother earth and her blessed medicines were available to my familys needs at a pit stop! !